A group of alleged gang members were caught on video hunting a 21-year-old man down “like an animal” before shooting him to death, the NYPD says. Taquan Eversley, 21, of Brooklyn, was shot to death in broad daylight behind a home on Elton Street in East New York on March 19, the NYPD said. Police are now searching for the gang members they say chased him down the streets and through at least one backyard before shooting him five times, killing him. Eversley was walking down New Lots Avenue by himself when he saw the group, according to police. A series of surveillance videos show the suspects waving their guns as they run down a sidewalk, past a home, through an alleyway and into a backyard while chasing him. 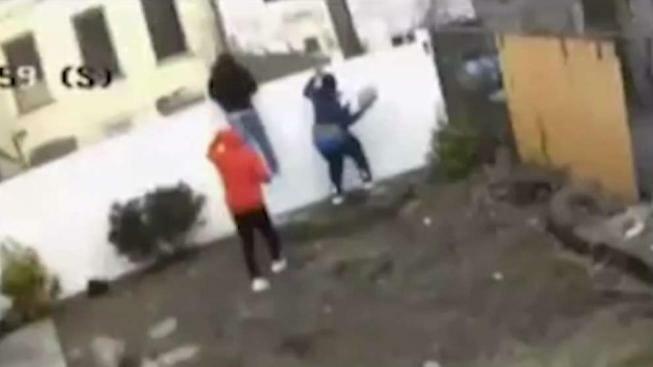 Eversley tries to hop a fence behind a home, but gets slowed down by barbed wire, video shows. That’s when his attackers catch up to him and shoot him, according to police. Police on Tuesday arrested 25-year-old Michael Reid, of Brooklyn, in connection with the shooting and charged him with murder and criminal possession of a weapon, but are still searching for the other suspects, including Donaven McDay, 29, Shacore Huff, 24, and Alfred Crooks, 22.